Comfortable, unisex designed, zippered front jacket features Italian collar and stylish fitted back. Crinkle Nylon fabric is reinforced at all stress points for long life. Hair and water repellent. 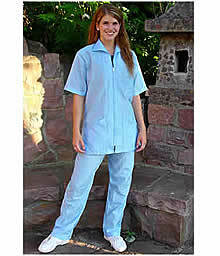 Short sleeves with two large hip pockets and one breast pocket. This Jacket has a wide band across the band as shown in the image above, resembles a doctors Jacket. 4XL AVAILABLE IN BLACK ONLY.